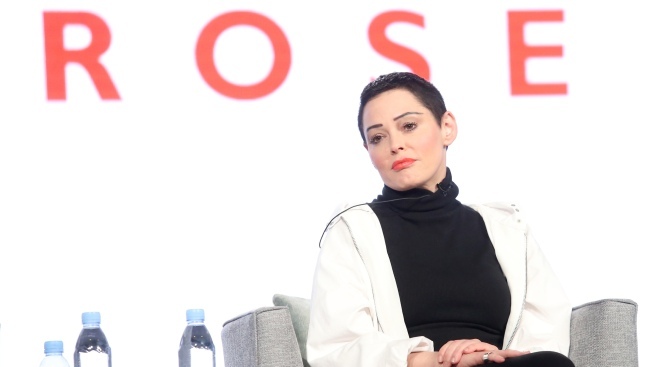 This Jan. 9, 2018, file photo shows Rose McGowan of "Citizen Rose" on E! during the NBCUniversal portion of the Television Critics Association winter press tour at the Langham Huntington in Pasadena, California. A Loudoun County grand jury handed down the indictment Monday. Charging documents say cocaine was found in a wallet McGowan left behind on a plane last year. McGowan has maintained the cocaine isn't hers, suggesting in court papers that the drugs were planted at the behest of movie producer Harvey Weinstein. He couldn't immediately be reached for comment. McGowan was among the first to accuse Weinstein of sexual assault, and she and others say he's aggressively sought to discredit his accusers. Weinstein has denied all accusations. McGowan's trial date will be set Tuesday. Her attorney, Jim Hundley, declined comment to media.